The glibc library has an efficient posix_spawn() implementation since glibc version 2.24 (2016-08-05). I have awaited this feature for a long time. TL;DR: posix_spawn() in glibc 2.24+ is really fast. You should replace the old system() and popen() calls with posix_spawn(). The fastest way to run something externally is to call vfork() and immediately exec() after it. This is the best solution if you don’t need to capture the output of the command, nor you need to supply any data to its standard input. As you can see, the standard system() call is about 12 times slower in performing the same operation. The good news is that posix_spawn() + exec() is almost as fast as vfork() + exec(). 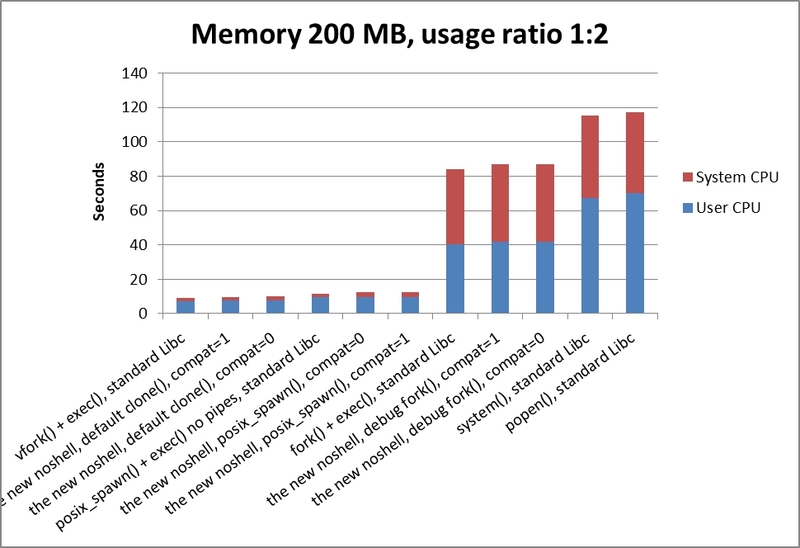 If we don’t care about the 27% slowdown, we can use the standard posix_spawn() interface. It gets more complicated and slower if you want to capture the output or send data to stdin. In such a case you have to duplicate stdin/stdout descriptors, close one of the pipe ends, etc. The popen_noshell.c source code gives a full example of all this work. We can see that the popen_noshell() library is still the fastest option to run an external process and be able to communicate with it. The command popen_noshell() is just 8% slower than the absolute ideal result of a simple vfork() + exec(). There is another good news — posix_spawn() is also very efficient! It’s a fact that it lags with 36% behind the vfork() + exec() marker, but still it’s 12 times faster than the popen() old-school glibc alternative. Using the standard posix_spawn() makes your source code easier to read, better supported for bugs by the mainstream glibc library, and you have no external library dependencies. If you want to communicate with the external process, there are a few more steps which you need to perform like creating pipes, etc. Have a look at the source code of “popen_noshell.c“. If you search for the string “POPEN_NOSHELL_MODE”, you will find two alternative blocks of code — one for the standard way to start a process and manage pipes in C, and the other block will show how to perform the same steps using the posix_spawn() family functions. Please note that posix_spawn() is a completely different implementation than system() or popen(). If it’s not safe to use the faster way, posix_spawn() may fall back to the slow fork(). Categories: Linux | Tags: benchmark fork, benchmark posix_spawn, faster fork exec system popen, fork vfork popen clone performance, Linux, linux clone, linux performance, linux threads, popen_noshell, slow fork popen | Permalink. That’s good news! Can you point me to the glibc version that got this change and/or the patch? Thanks a lot for your code and these blog posts. Very informative. Unfortunately, I am stuck using an older glibc (RHEL 7). So I am considering using your popen_noshell implementation. Quick question: Does it avoid the various issues identified here? The setuid() issue is not a concern for me (although it might be for someone), but the race condition involving signal handling seems very dangerous and could result in impossible-to-find bugs. Hi. The “popen_noshell” library does not handle those corner cases.